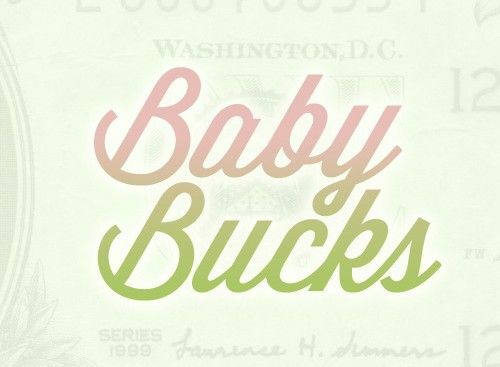 In the Baby Bucks series, we babble about babies and money and sleep deprivation and cuteness overload. In that order. In one week, our girl will be four months old, so we thought we’d update you on our parenting journey so far, financial and otherwise. Gripping: Babies have tiny fingers. But these fingers’ gripping ability is a gazillion times stronger than the average adult’s. And things get grabbed that shouldn’t. Like the apparent extra skin on my forearm. Or Johnny’s arm hair. Or my hair-on-my-head hair. Or necklaces. Or the package of raw chicken breasts that you’re trying to open while holding said baby in a front pack. Nothing is safe. Hide yo kids, hide yo wife! Drooling: Imagine a bulldog with thick strings of saliva running down its jowls and you now know what four-month-olds are like. That said, there’s much less spit-up going on these days, so it’s a fair tradeoff. All hail the mighty burp rag and its multipurpose use for every stage of our baby’s mouth. Laughing: Our girl laughed for the first time a week ago, and we now spend all our time trying to make her laugh again. We’ve succeeded only once every other day or so because we’re never quite sure what will put her in a giggling fit. A few days ago it was just being in Costco and seeing lots of people. Hilarious, I know. Another day it was Johnny sneezing. And recently, we’ve been able to get some consistent giggles by putting her in front of a mirror. But the payoff is so worth whatever bouncing, tickling, and funny faces that are necessary to hear that sweet sound. Being Parents: The people we were pre-Baby Girl are not the same people we are now. Having a baby changes you. It forces you to stretch, grow, and get real uncomfortable (and sleep deprived). For the first time in my life, I’ve learned what it is to be completely selfless. There is no reward or the comfort of knowing you’ve completed a job well done, because the job is never done, and there will always be highs and lows. But we’re better people because of it. And we have a little human in our lives who is preeety incredible and we love in an unconditional way that only parenthood can bring. Johnny and I have never felt so complete, rundown, and happy. Our 4-month ball of joy. Diapers and Wipes: Keeping our girl’s bottom clean and diapered continues to be our main expense. Before she was born, we wrote about finding the best bang for our diapering buck. I’ve found a brand that works well for us, and I order it from Amazon and save 20% using Amazon Mom with the Subscribe & Save feature. Our monthly diaper expense totals about $50. 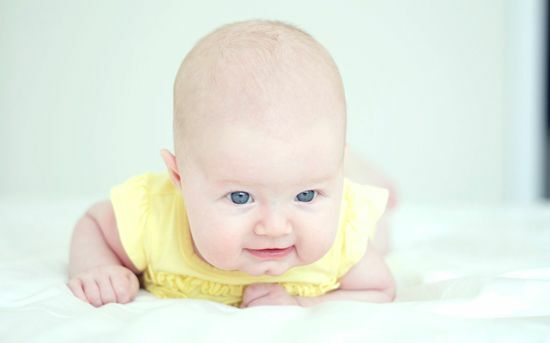 Four-month-olds poop about 10x less than newborns, which is kind of awesome. Clothing: We still haven’t spent much in the clothing department thanks to Johnny’s sister sending us her girls’ clothes. But I have spent close to $20 on a couple extra footie pajamas since there’s a 50% chance she’ll pee while I’m changing her diaper right before bedtime. Which is always accompanied by a massive grin that makes us think she knows exactly what she’s doing. Our girl loves an excuse for a wardrobe change! Shipping: When Johnny’s sister sends us baby clothes, we pay for the shipping. The box of three- to six-month clothes we received cost us $20. It’s well worth the savings of not having to buy new clothes each month when our girl has a growth spurt and hulks out! Toys: Toys are very necessary little boogers. Our girl is really loving to grip and hold onto and shake and slobber all over her toys right now. I’ve spent about $40 on different teething toys, and we received some as gifts as well. Books: Even though our girl doesn’t like being read to yet, I still give it a try at least once a day. I’ve bought her four books, totaling close to $25, to add to a few we got as gifts before she was born. I will teach our girl to love books if it’s the last thing I do! Plane Tickets: Our main vacation in past summers has been to a beach somewhere far from home. But this year we’re heading to go see family instead. We probably couldn’t justify flying out to see them if it weren’t for Baby Girl. We’re just dying for her chubby cheeks to be seen and kissed by everybody. We’ll be using credit card reward miles to get there and back for $0. And we’ll still get a weekend trip to the beach in, which is probably all we’re up for with our girl in tow! Sand and diapers and feeding and drooling and sand and sun screen and sand…sounds like nothing can go wrong. So that’s our four-month-update on our little monkey. Our daily expenses aren’t nearly as affected by a baby as I thought they would be. Our water bill may be a tad higher from extra laundry and baby baths. And the diaper expense is definitely something. But for the most part, our budget has stayed relatively neutral. I know our girl will just cost more as she gets older, so we better save now while we can! For the been-there-done-that crowd, does this sound pretty typical? How do we relate and differ? Anyone have some tips on entertaining a four-month-old because I’m running out of ideas! Did I miss it in a previous update – was adding baby girl to your insurance expensive? Or not with Johnny’s cadillac health plan? Changing our Married plan to Married + Dependents has definitely been our biggest expense at $100 extra/month. We’ve definitely gotten our money’s worth over the last four months, but it will be a money drag over time. But if there’s one thing I don’t mind putting a little extra money toward, it’s health insurance — especially a $0 deductible/0% co-insurance/no max plan at that. Adorable! Happy 4 Months to Baby Girl, I bet she will be a huge hit with the family. Maybe in the future the grandparents will spring for a big family getaway… a cruise to somewhere beachy? Man, I wish… but that probably won’t be in the cards. We’ll be lucky if they spring for a dinner at Sizzler. But that’s just fine with us so long it’s with the fam. Our little guy loved playing with paper because it made noise. So that is something that is pretty cheap to give them, just have to watch her to make sure she doesn’t “gum” it up too much and swallow a lot of it. He has recently become obsessed with glasses on people’s faces, but only if they are on their eyes. If they are pushed up into their hair he could care less about them. He uses his shocking baby speed and go-go gadget arms to get them! I hope baby girl does well on the flight! We got lucky and our little guy travels like a pro (just got back from his first international trip a couple weeks ago)! We’ll give paper a try. And if that works, we’ll just give her wrapping paper for her first birthday and forego the gifts. Woah, international traveling baby! That’s impressive. Did you guys use Benadryl or anything? That seems to be the recurring advice we’ve been getting. We had it just in case, but never gave him anything other than a bottle and a pacifier during takeoff / landing. We are very luck he is pretty laid back. His first flight was at around 4 months old and we were pretty nervous but like I said he is a PRO. My only advice is to sit either in the back of the plane (so you have that galley to pace in) or in a bulkhead (so you have that space for baby girl to play on the floor). The bulkhead will probably cost you extra since airlines consider that premium seat. The other drawback is you don’t have storage in front of you so quick access to a bottle is limited, which I’m sure you know can cause MAJOR drama. Yep, as parents and now grandparents, we are definitely part of the “been-there-done-that crowd”! 5. repeat as often as desired (or until exhaustion sets in). Great video Rob. I think allowing the baby watch other babies giggling will do the trick – well this works with adults too. Agree? I tried the peek-a-boo technique a month or so ago and got some smiles, which would probably be laughs now. So I’ll have to throw that back in my arsenal of tricks. And Joanna and I just watched that video sans baby. Twice. We’ll let her watch tomorrow. Aww, so cute. I can definitely empathize with all the 4mth old milestones, you’re going through. My baby boy turned 4 mths. a week ago. He’s my third and last baby boy, so I’m enjoying it, poop blow outs and unexpected pee showers and all. LOL! I’m also part of Amazon Mom as well to save money. As for entertainment my son thinks it’s hilarious when I do jumping jacks. I’m sure that watching the last baby grow is a lot like the first. We’re trying to savor all of the memories with our total naiveté, but come baby #2, we’ll probably be like whatever. I’m a second child and I didn’t turn out too too awful. We’ll try out the jumping jacks. We could probably use ’em anyway. Thanks for the update. As somone with no kids yet, it’s great to read about the progression (both financial and non-financial) to kind of get me ready for when my wife and I have kids. You’ll be the most prepared parents on the block. Whenever I used to and still think about not knowing enough to be a parent, I just remember that people were parenting 100’s and 1000’s of years ago. And somehow the human race figured it out then, so we’re fine. What credit card do y’all use for sky miles? My husband and I are trying to figure out how all of that works! Thanks! We use Southwest Visa (through Chase) and a JetBlue AMEX. But since moving from Boston, we’ve been only using our Southwest card since we’re in a Southwest hub city. A word of caution on both: they do have annual fees, so wait for a great intro promo where they give you a ton of points right off the bat and do the math and make sure that it’s worth it. And we always remind, don’t get one if you can’t pay the balance in full every single month. We’ve been meaning to do a post on this, so we’ll try to schedule one in the near future. Oh the last picture! Those cheeks, those thighs, that chin! Too much cute for one picture. I have to say that while we are nowhere near ready for parenthood, it does seem like it’ll pretty freaking cool someday. Until then I just get by with enjoying nieces, nephews, cousins, and friend’s kids (and deal with all the relatives asking when we’re going to start trying). I have to wonder how you guys get anything done? Don’t you want to sit around all day and just stare at her? Babies turn me into mush and I can’t concentrate on anything else, so I can only imagine having on of my own. It is totally freaking cool. Especially now that we’re getting so much reaction and interaction out of her. It’s the best. And we don’t get anything done—when she’s awake. And therein lies the trick. Our after-work-and-baby-work work hours run from 8pm to whenever we finish. Childrens books can be found by the bag full at garage/yard sales, same goes for toys and clothes. The general rule of thumb is to simply travel to a neighborhood you wished you lived in and purchase the stuff they were eventually going to throw away. Good call! And that’s a great tip about the neighborhoods. I always found that the thrift stores I’d frequent in high school and college that were closer to affluent neighborhoods had the better snags. Luckily our girl doesn’t need much yet, but I’m sure we’ll be on the garage sale prowl here for toys/books/etc. in no time. No baby advice but what a sweetheart! Love the caption on the last photo. She’s really good at her serious face. But she can’t hold it too long before breaking into a big grin. Unless she’s hungry, and then it stays. Love it. My son is only a week older than your baby girl, so I know exactly what you are talking about. Our son laughs all of the time now and I have some ways of getting him to do it. There is nothing better than having your baby laugh and smile. I agree with you on the drool. Where in the hell is all of that coming from? My son likes to grab my shirt and never let go. He grabs his mom’s hair and that is always fun for her. Man, that vice grip is something else. The hair on my wrists is almost completely pulled out from walking around with her this weekend in a Bjorn backpack thing at Costco. I should be grateful that she hasn’t found the hair on my head yet like your and my wife. Your baby girl is adorable! I would say you are doing really well on baby expenditures. I think we have been pretty budget minded when buying things for our daughter. 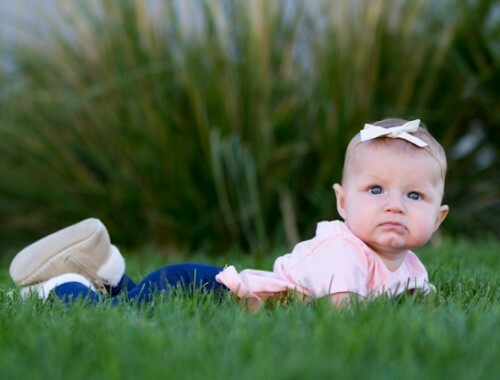 My daughter will be 1 in just a few short weeks (yay!) and I feel like she is just starting to get expensive now there are items like organic dairy etc (which really break the bank) . My husband and I only eat yogurt as a dairy source so that is new territory for us and we did not realize how expensive it was! Also, now that she is walking there are trips to Stride Rite for $30 shoes but we feel good shoes for her feet are important. We have averaged about $50-60/mth for Pampers diapers and wipes by me shopping deals but with the second Amazon subscribe and save will be the plan. She was 6 months at Christmas so grandparents got her toys. We set a $75 limit for her gifts from us (mostly board books) and decided $50-75 for her birthday presents. Outside of that we have spent $40-50 on toys. (Sophie the Giraffe was the best $20 we spent -she has used that toy for almost 9 months!) We have not bought any books besides Christmas gifts. We have spent about $150 for clothes to last through this summer including winter jacket for last year and this year. I know that is high but I will only shop new. My niece was born in another season so her hand me downs never fit in the correct season-would have accepted them other wise. It’s so great you are able to do that! Like I said our biggest expenditures have been quality food and all those miscellaneous baby supplies add up to! We have really generous families so I think that has really helped! Congrats on soon-to-be 1 year! It sounds like you guys have handled the first year really well financially. One thing Joanna and I have talked about with our first baby is that everything we get now is an investment for baby #2, #3, #8. Ok, maybe just 3. But point being that we might have a bigger budget on books and toys and clothes knowing that future kiddos will have them, too. We’ve only just begun to see the worth of that dumb little giraffe. So I’m glad to hear that the ROI keeps on giving. Thanks for sharing your insights one year in! Yes that is so true! I have taken miticulous(sp?) care of all her toys and clothes hoping we have another girl My advice on toys is try to keep the big ones more gender neutral and ask for them for Christmas, birthdays etc I love books so its hard not to want to buy books all the time…thankfully I had a book baby shower so we got about 20 books! Such a great idea! I have a list of about 100 books and I put them on Christmas and birthday lists as well as buy her them for those gifts. However once your little one gets teeth…watch her with the board books! My daughter likes to bite them when her teeth are coming on! I would say books are the best toy investment! My MIL saved all her children’s books and once each child has a child she gives them their books Legos tractors etc! I forgot to mention we set a budget of $1500 before baby girl was born for “essentials” (crib, mattress, nursery furniture, decor, stroller, car seat, swing/bouncer etc). I would suggest a big way to save $$$ here in a few months is to make your own baby food and also buy some reusable baby food pouches. There are a lot of blogs that do $20 1 hr 1 month of baby food! Our daughter loves animal sounds to make her laugh. I am all about gender neutral. Save for the hand-me-down girl clothes, nothing we own is pink or gender-specific. I think it was hard for Joanna in the beginning, but she’s totally on board now. That book baby shower is an awesome idea. I’m sure Joanna would love to propose that for friends that are expecting. 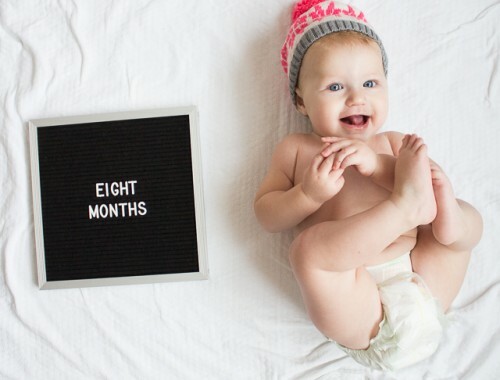 I, too, was amazed at how little our outgoing cash increased when our Baby Girl was born. Diapers weren’t nearly as expensive as I had feared, although I stock up when they’re on sale at Target, and use coupons like it’s my job. When we did start to notice an uptick in expenses was once BG started eating solids. Though never on the organic food train before, I started thinking about how I had a pure, fully natural little being, and why would I want to start putting unnatural fillers and other processed stuff into her? So we started her on organic baby food. But that led to me thinking, “If we don’t want to put that in our daughter, why do we want to put that in ourselves? ?” and we started buying more organic meat and produce and less processed snacks. So our grocery bill has definitely ballooned and overtaken the “savings” we have from not eating out as much. I keep saying it’s a worthwhile investment, though, especially if it leads to us living longer and healthier lives. Garage sales and consignment stores (local, and places like Once Upon A Child or Kid to Kid) are great sources for cheap baby clothes. Tummy time, a play mat gym, and foldable stand-up “books” (similar to this: http://babyology.com.au/sunday-arts/a-little-book-of-faces-for-baby.html) were what our little one loved at that age. Wow, we really haven’t even thought about that. I’ve never really been an organic believer or anti-processed food, but everything you just said really struck a chord with me. That scares me a little bit. My greatest aversion to joining the natural food craze is cost. Also my extreme dislike for Whole Foods, but that’s another post for another day. But you’re definitely right about the value being worth it if it means a healthier, happier, longer life. Thanks for sharing your tips! We always appreciate hearing them. I know, it scared me too! After our savings and our mortgage, food is the biggest category in our budget right now. And trust me, we’re not eating filet and lobster every night! I do find that coupons are often available on the name-brand stuff, and our local grocery chain has an ever-growing line of natural and organic products. That helps. (We don’t have Whole Foods and just got our first Trader Joes.) I also use ewg.org’s list to the Dirty Dozen of produce — I buy the Dirty Dozen organically whenever possible, but cut myself some slack on the others. I’m also trying to make deliberate decisions on what’s worth the money and what’s not. Though I’d love to buy everything organic or all-natural, I can’t afford to. I’m still refining as I learn more. I’ll share if I have an epiphanies! Awesome. That’s helpful. And we’re all ears if and when they come. What a little cutie! Enjoy this stage, mine are all mid to late teens and I don’t know where the time has gone! Ok the dribbling and drooling. It generates an insane amount of laundry, which is a cost in itself. to say nothing of time doing said laundry. My sis-in-law started her family well after us so we get to see all the up to date ideas. Teething necklaces. I don’t what the official name is but a work mate who has a baby calls them “dribble beads”. They are made of amber and seem to soothe the dribble situation and because I was fascinated (and envious that we didn’t have this idea when mine were little) I have noticed that most babies seem to wear them and it has become quite fashionable. My SIL swears by them and she’s not an easily influenced consumer. She has had them on all three of her little ones, She does recommend finding one that is ‘baby-safe’ – I think she paid a wee bit more to get one that was designed with safety in mind – who knows it might have been a marketing gimmick to get more money for the same item – but she didn’t want to risk small parts being eaten or something that baby could strangle herself with. – so any extra money was worth it, I don’t know how much difference it was and I think the cheaper alternative was a home made operation. I have done a quick google and there are also amber bracelets but I understand the necklaces are better as they are bigger and closer to the area. The dreaded teething! We’re not quite there yet, but we get the sense that it’s right around the corner. We’ll definitely look into the necklace. Seems pretty intuitive like those pacifier clamp/leash things. Hi again, I checked with my SIL – and the amber beads will definately help with the dribble. She’s used with all of her babies. Her eldest, she used to go thru dozens of bibs and tops each day, and she was told about the amber beads and (as long as there was no other spills) she only went thru one top and bib, maybe two if there was food involved, per day. I work with a guy and his son has the amber beads and he swears by them and reckons that most of the kids at daycare have them. The only link I have is a New Zealand site, but at least you’ll see what they look like. I even know someone who has put these on their dog to stop drooling. Our little guy is 8.5 months now. We bought a few clothes at first and maybe one or two toys, but we realized how quickly he grows out of everything and just put a stop to all of it. He gets clothes and toys as gifts but we already have way more toys than we need. He’s just about to become mobile so we’ll see what new expenses hit once he’s crawling around. We now use reusable cloth diapers. A bit of up-front cost and then it’s just a matter of paying for laundry going forward. It’s so not as bad as you would think. We’ll use a disposable at night just for more absorbency but every time I throw a diaper in the garbage I feel guilty. I’m planning a post on these diapers in the near future. I’ll try to remember to link over here when that goes live. Clothes… don’t even get me started. Luckily most of ours were hand-me-downs to borrow, but I couldn’t imagine buying new sets of clothes every few weeks. Also for future babies, we’ll only invest in a single presentable outfit that’s used for outings and meeting people. Otherwise, there’s no reason to do anything other than ugly one pieces for that entire first year. We definitely debated cloth, but opted for disposal. I don’t think we’d change our minds for the first three months when she was needing a change every hour, BUT now that she goes less frequently, I could totally see it being feasible. I’m curious about the cost savings of cloth diapers! It seems like it certainly could save money, and would also be better for the environment. Win-win! The only lose of the win-win was time/convenience, and unfortunately for us, we needed those two things more than money and trees. But we’ll definitely be looking back into them now that things have settled ever so slightly. Think ahead to what outdoor toys you might want for her for the next summer/winter and scan rummage sales or craigs list. Those chunky plastic slides or climbing sets, sand boxes, sleds, any outdoor toys can be found super cheap in spring time. Looking ahead of time helped us for when our son was ready. There was no scrambling around trying to find stuff for him, or gasp, paying full price for it! Awesome idea! I have a hard time imaging our little butterball actually walking and climbing and doing things, but you’re spot on with looking now. Thanks for the tip. OMG – she’s too freaking cute!! I can see how you are both totally in love with her and not getting much done when she’s awake! Might I suggest (if you haven’t already) to get her on a schedule!!! This will make everyone’s life so much easier. Kids to better on a schedule – and DO NOT deviate from it unless it’s something really, really important. It makes getting them to sleep so easy – make rituals – like read a book, rock for 5 min,, etc. then throw her in the crib. If she cries – let her. She’ll learn to self-sooth. And before long you’ll put her in there, she’ll roll over and go to sleep! A schedule gives you a much better handle on planning your day, too. And a baby who’s well-rested is a baby everyone wants to be around! 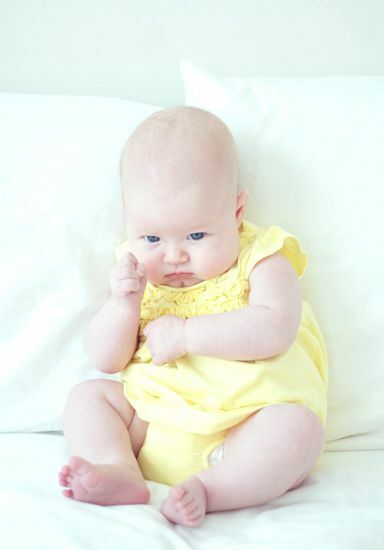 Oh, also – for baby clothing – have you ever tried a thrift store? Seriously! You can find Baby Gap, Gymboree, all that over-priced stuff – some of it may even still have the tags on it! You just take that stuff home, throw it in a load of hot water/Tide, and you’re good to go! Seriously, you’d be saving BIG BUCKS here! I know you get some from the sister – but check a few of them out yourselves! Also for toys – as long as they can be cleaned up with ammonia, etc. You’re saving the landfills from all of this crap, too! We’ve actually been doing really well on the schedule the last month. She’s still not crazy about naps, but she goes down at night around the same time and sleeps through (hallelujah) until 7am-ish. And hopefully the daytime nap part of it all gets better. We haven’t really needed to shop for clothes yet, but when we do, we’ll definitely check out thrift stores. It’s crazy how short-lived baby stuff is, so I’m sure the thrift store is a goldmine for good stuff. And I’ve never turned down an opportunity to go to a thrift store. The great thing about 4 month olds is that they’re happy just “being”, going for a walk, having you talk to them, etc. As long as they’re being interacted with in some way, they’re perfectly happy. :-). Invite friends over or visit friends, or hang out at the park, that kind of stuff. You guys are doing such a great job with her already, I can tell by her happy little face. She is totally in that “being” state right now. It’s so much fun. She’s smiling/content 75% now, as opposed to the grumpy/blah-face last month. It’s a fun age and I think we’d be alright with her just staying in it forever.